Spring is here! Your shrubs are pruned, your tulips are blooming, the birds are chipping and your garage door has chipping paint and dirty windows. Yep, your garage door could use a makeover. And guess what? It may not be as hard as you think! A fresh coat of paint can go a long way when it comes to a garage door. In fact, it can be the finishing touch to your home's exterior makeover. Let's learn how to paint a garage door to get the best aesthetic results for your home! 1. Begin with a 2in wide brush. After thoroughly mixing the paint, start with the top panel of the garage door. Paint into the recessed area of the panel, starting at a corner and continuing around the perimeter. 2. Paint the remainder of the panel, until it is entirely complete. Wipe away any excess paint that has overlapped onto the stiles. Repeat until all the panels on your door are complete. 3. Starting at the top corner and continuing around the walls, paint around the perimeter of the garage door itself, in 2in-3in wide sections. 4. Using a roller, paint the stiles around the perimeter of each individual panel. Continue until the garage door is complete. 5. Using your brush, paint the inside frame of the garage door, starting at the top and continuing down the sides until the frame is complete. Wipe away any excess paint. 6. Paint the side edges of the trim (where the trim meets the wall), starting at the top corner. Continue until all edges are complete. 7. Finish your garage door by painting the face of the trim, across the top and down the sides. Painting a garage door is an easy spring fix for your home! It's pretty surprising what a difference a coat of paint can make. 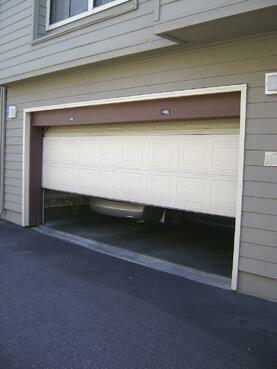 If your garage door is in good working order, there isn't a point to purchasing a new door entirely. However, think of us first when the time for replacement comes! We have a wide selection of both residential and commercial garage doors and unbeatable service to match! When hiring someone to work on your home, whether it be to remodel your kitchen or install a garage door, you want someone who knows what they're doing. Not only do you want experience and expertise, but you want a reliable product. You've found that combination with Overhead Door. At Overhead Door, we have created the industry of overhead doors. Since 1921, we have lead the industry by providing a high-quality product and honest, reliable customer and product support, while maintaining our honest and trustworthy reputation. We understand your needs and do everything in our power to exceed your expectations. In addition to providing a reliable product, we have a comprehensive selection of overhead door system solutions. From garage door maintenance tips, owners' manuals and easy downloads to step-by-step programming instruction and settings help, we make servicing your garage door simple. O verhead Door is one of the most recognized andrespected brands in the garage door industry. With our nationwide network of more than 450 authorized Ribbon Distributors, we are a leading provider of overhead and garage door systems, and we continue to lead the way with innovative solutions and unmatched professional installation, service and support that keeps customers coming back. We strive to give our customers confidence and peace of mind. So, the next time you have an overhead door need, whether it be commercial or residential, think of us first. We assure you won't be disappointed. Ahhh, spring is finally here! After a pretty harsh winter, most of us are ready to get outside and clean up…but where do you begin? No worries, we're here to help in our outdoor spring cleaning guide! Start by pruning away dead or damaged branches back to their live stems. For stems larger than 1/2 inch in diameter, use a hand saw. Use electric shears to shape hedges, rather than hand pruners that prevent growth by prohibiting sunlight and air into the center of the hedge. Next, rake out dead foliage and fallen leaves from flower beds. After the threat of frost has passed, you can remove existing mulch to create a new layer for spring planting. Additionally, you can lay down a pelletized fertilizer for spring rains to carry it down to the roots of existing plantings. Compost yard waste for future use by dumping collected organic yard waste (leaves, cuttings, spent foliage, last season's mulch) into a 3ft x 3ft x 3ft bin. Shred leaves and chip branches to accelerate decomposition. Keep the pile moist and aerate it with a pitchfork every couple of weeks. 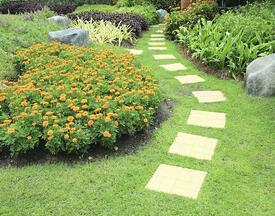 Clean up yard paths and patios by raking escaped gravel back into walkways and crevices. Refill these crevices by sweeping in new sand or stone dust, water to set, and repeat if necessary. If pavers are out of place, remove them and reset the base material before placing the pavers back in. Patch worn wood by scraping old paint and sanding wood all over to prep for a new finish coat. This new coat can go on once temperatures go above 50 degrees. Rotten wood sections can be patched with wood epoxy. There you have it, 5 steps to kickoff your outdoor spring cleaning! Keeping your home in good shape and adding to the aesthetic appeal when you can will only benefit your investment in your home. 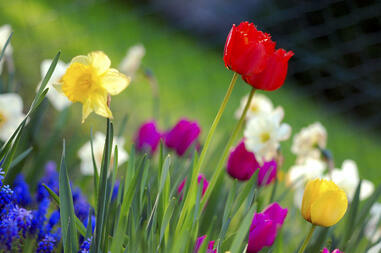 Happy spring from Overhead Door! Daylight savings is happening on Sunday! With warmer weather hopefully soon to come and winter a thing of the past, we can now focus on turning those heating systems down and saving on home energy costs. Given the moderate temperatures, it is important that you keep your thermostat as close to the outside temperature as possible. This will require your heating/cooling system to work less, which in turn saves you money! Open your windows and let the outdoor air do the work. With beautiful days to come it is great to open up your home to the outdoors. Always remember to turn off your thermostat when your windows and doors are open so you aren’t wasting energy. With the sun going down at a later time, you now can now enjoy your day even more. Try mixing up dinner by eating outside. Bring out the grill and have a party! Using less energy indoors means a smaller energy bill, so enjoy the outdoors! For more information on how you can make your home look better this spring visit our design center!